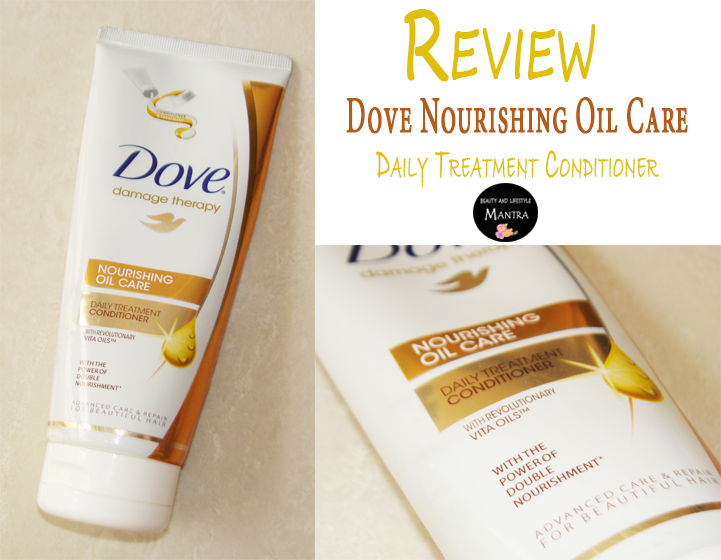 Nourishing Oil Care Daily Treatment Conditioner. Next Generation of Conditioner with a Golden Ribbon of Treatment Inside. Did you know? Dryness and dullness are signs of damaged hair leading to to hair that’s weak and rough to touch. That’s why new Dove with Vita Oils goes deep inside and restores smoothness, softness and shine. Dual Action Formulation: With the power of double nourishment. Gold Stripe: Contains revolutionary Vita Oils treatment to deeply nourish and replenish essential nutrients, leaving NO GREASINESS. White Stripe: Contains conditioner that seals cuticles to lock in nourishment and smooth frizz. After shampooing, massage conditioner through hair and rinse thoroughly after 1 to 3 minutes. For the best result, use daily with Dove Nourishing oil care shampoo and use weekly Dove Nourishing oil care repair mask. The first noticeable thing is that, when you start squeezing this product into your palm, it looks two-tone color, golden stripe and white stripe. The Gold Stripe contains weightless nutri-oils that provide intense nourishment to your hair. It also restores the vital nutrients. The White Stripe retains the nourishing components and helps maintain healthy locks. It is a thick cream basic conditioner. The smell is rich and sweet. Throughout the day I feel the smell. Flip-top plastic tube packaging is travel friendly. You can easily carry around in your bag while travelling without fear of leakage and spilling. After shampooing I apply it to the length of my hair and rinse thoroughly after 2 to 3 minutes. It takes a very small amount conditioner for the use. I can immediately feel a difference in my hair, which feels instantly softened, detangled and nourished. 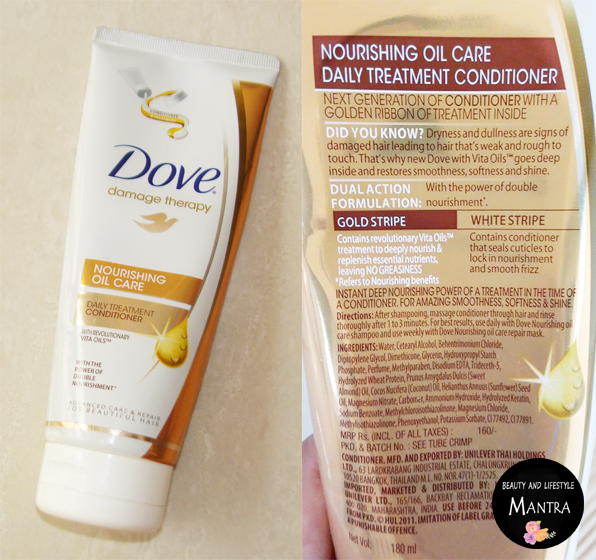 For the best result, you can use daily with Dove Nourishing oil care shampoo and use weekly Dove Nourishing oil care repair mask, which is already mentioned in the tube. Comes in a travel friendly packaging. Overall, it's a pretty good product and I am really happy with the results. I think it should work well with people who have dry and rough hair. So, I would recommend this to anyone who wants healthier and softer hair. Also, I would say it is a good buy if you are looking for an affordable product.